Another day, another Nokia Android rumor. This times its just more than a rumor, we can easily mark this as a confirmation. Today Nokia X (also known as Nokia Normandy) has entered benchmark database - the one of Browsermark 2. 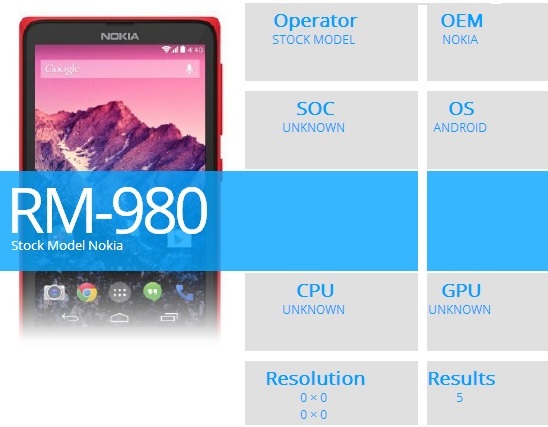 According to the submitted info, Nokia X's model number is RM-980 and its Chrome browser scores 1885.88 on the test. According to the rumors, Nokia X won't be a Google certified phone, which means no Google Services including the Play Store. Nokia will reportedly provide its own application store, but the users will be able to side load apps, too. This information contradicts the previous leaks by an online retailer where they said that Nokia Android will support all Google services. As of now we know some of Nokia X specs too - a 4" WVGA display, dual-core Snapdragon 200 chipset, a 5MP cam, 4GB storage, dual-SIM, six different colors, stripped down Android 4.4 KitKat. It is expected to go official at the Nokia's pre-MWC event in Barcelona next month.